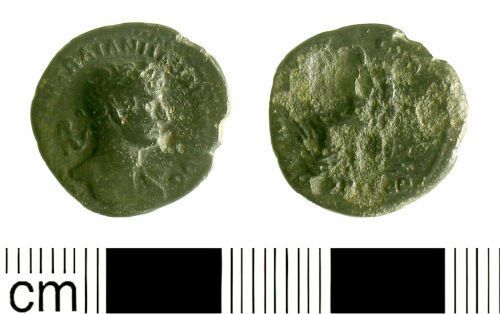 A corroded and slightly worn silver Denarius of Hadrian; PM TRP COS II (Fortuna seated left) reverse type; minted at Rome in AD 118; RIC no. 41. Measures 17.6mm in diameter, 1.8mm in thickness and weighs 2.38g. Obverse description: Laureate bust right, drapery on left shoulder.